For more than 90 years, kids in California enjoyed creating parades of Circus Animal Cookies baked by Mother's Cookies, an iconic grocery-store snack brand headquartered in Oakland. But this generation will be the last to munch on the bright-pink frosted animals: Mother's Cookies crumbled on Oct. 6, when the owners abruptly shut down and filed for Chapter 11 bankruptcy protection. They blamed a variety of economic factors, including the rising costs of fuel, flour, butter and sugar. "It's a tough market in which to find credit," said Barrett Golden, spokeswoman for Catterton Partners, the private equity firm that bought Mother's Cookies a few years ago. The flagship cookie's image will live on in a hipster homage. 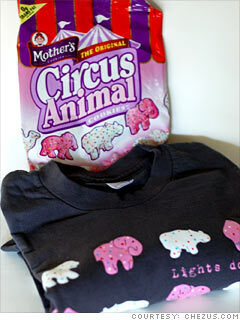 ClothMoth, an independent t-shirt company based in Houston, created a tribute tee featuring rows of Circus Animals and a bittersweet farewell: "Lights down, little cookies." Until its supply runs out, ClothMoth is shipping a small bag of the cookies with each shirt order.